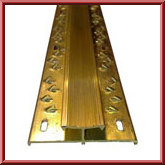 Carpet Threshold bar double plates suitable for joining carpet to carpet. Available in two finishes either polished aluminium ideal for the more modern household or the more traditional brass effect. Our carpet to carpet door bars come in 35" lengths. This type of doorbar is designed to be used with all carpets fitted on underlay and gripper. When choosing the colour of your carpet door bars remember to match with existing door handles and light fittings. 7 Lengths is enough to cover the doorways of an average sized house.We also sell single threshold door bars and wide threshold door bars.